Philadelphia, PA, November 23, 2010 – Prominent elected officials, community leaders, noted performers and thousands of supporters recently gathered on Independence Mall to celebrate the Grand Opening of the new $150 million National Museum of American Jewish History, with Vice President Joseph Biden giving the keynote address. 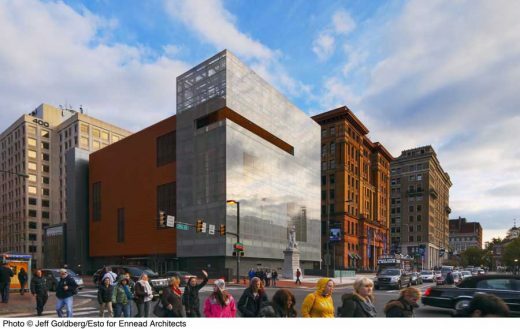 The NMAJH, a Smithsonian Affiliate, relocated from the 15,000-square-foot building it had occupied since its opening in 1976 to its new 100,000-square-foot,five-story building on Independence Mall at the corner of Fifth and Market Streets. Designed by architect James Polshek of Ennead Architects (formerly Polshek Partnership), the NMAJH is the only major museum dedicated solely to telling the story of Jews in America. In addition to Mr. Polshek, Partner-in-Charge Joseph Fleischer, Associate Partner for Design Robert Young, and Project Manager Josh Frankel led the design team. The site’s prominence demanded an architectural response iconographically appropriate to the historic city fabric as well as publicly expressive of the Museum’s mission. Interlocking volumes – one opaque and enigmatic and the other translucent and open – characterize the design concept. The visual accessibility of the glass volume on the Mall conveys a generous welcome to people of all ethnicities and religions. The contrasting opaque terra cotta structure contains the principal exhibition spaces. Its solidity is a metaphor for the strength of Jewish survival and the protection of the freedoms that are fundamental to American history. The warm tones of this masonry enclosure complement the adjacent Bourse as well as the brick structures in Philadelphia’s historic core. 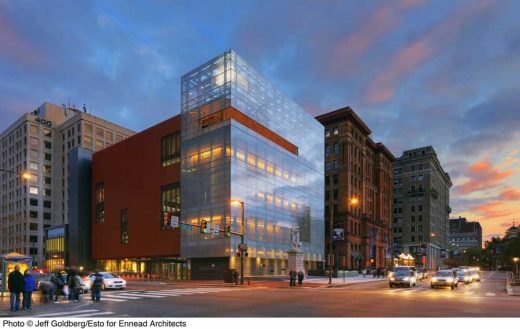 Merging the glass and masonry volumes, the interior is arranged on six levels, featuring four floors of interactive exhibition space, a changing exhibit gallery, a 200-seat auditorium and education center. An eighty-five-foot-high, light-filled atrium creates a dramatic spatial connection throughout the Museum, allowing the visitor to readily comprehend the organization of the Museum from any point. The sculptures Religious Liberty (1876) and Beacon (2010) are integral to the architectural concept. The carefully restored 19th-century Religious Liberty contrasts dramatically with the minimal glass veil of the façade to suggest the connection between the past and future of the Jewish community in America. The LED sculpture Beacon by acclaimed media artist Ben Rubin is located in the uppermost corner of the glass façade; its undulating panels appear as pages in a book, inspired by the Talmud, one of the central texts of Judaism. For Mr. Polshek, Beacon has a dual meaning: one is universal – a reference to the torch of the Statue of Liberty – and the other particular – a metaphor for the eternal light. This internationally acclaimed design firm engages in work across the spectrum of architectural endeavor, including new building design, planning and historic preservation and adaptive re-use. The majority of the partnership’s buildings are for not-for-profit educational, cultural, scientific, and governmental institutions. Projects have been recognized for their significant contributions both the cultural life of their communities and to the enhancement of their physical contexts. 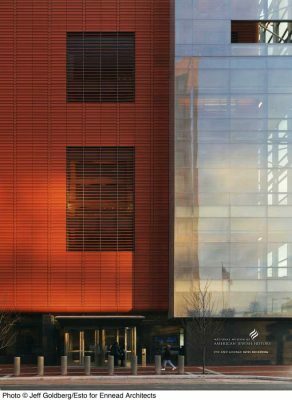 Among the firm’s award-winning projects are: Rose Center for Earth and Space at the American Museum of Natural History, William J. Clinton Presidential Center, Santa Fe Opera, Carnegie Hall Renovation and Expansion, Yale University Art Gallery Renovation and Expansion, The New York Times Printing Plant and the Brooklyn Museum Renovation and Expansion.